Everything in the house is acting up. The fridge has melted ice, the radio is acting strange, etc. I multimetered the panel box and each breaker is either 90 V or 140 V alternately. I have a plan to upgrade the box from 100 A to 200 A as the meter shows the system is set for 200 A. But meanwhile everything is acting up. The fact that you've worked on your panel is unrelated. Given the testing you just did and the results you got -- you have a power outage at the meter pan or before. It could be where the neutral service wire connects to your neutral bar, but that's the only place it could be on your side, and super easy to check. To be more precise, the type of outage is a "Lost Neutral". Loss of a supply wire at or before the meter pan is a power outage. If the dead supply wire is a hot, half your panel will work. If the dead supply wire is a neutral, your 240V loads will work and your 120V loads will have scary weird voltages on them. It's still a power outage and should be treated as such. As long as you are confident in the quality of the connection between your neutral service wire and your neutral bus, you should button up the panel and there's no reason to show it to the power company. Everything they'll care about will be at the meter pan or their side of it. DON'T procrastinate this or try to work around it by balancing loads etc. Seriously, unless you plan to shimmy up a pole with a set of Allen sockets, every possible path ends with you calling the power company and them fixing their service-drop issue. Which they will do for free, same-day and probably 10 minutes up on the pole. And then you'll be like "darn it Harper, why didn't you lead with 'Call the power company', why send me in circles doing all that other stuff first?" The transformer's secondary is 220V-240V, and it is tapped in the middle to produce 120V between the center tap and any of the two ends. Connecting between the red and black phases gives you 220V-240V. Connecting between a red or black wire and the white gives you 110V-120V. The neutral wire (white) is grounded at the box or at the utility's equipment, so there should never ever be voltage on a neutral wire. If the lamp and TV are on, this will work fine because they consume the same current and will split the 230V 50/50, so you decide not to call an electrician. Now, you decide to turn off the lamp, and the TV no longer works (it has no neutral, so its current return path was through the lamp). The fridge compressor starts, so now you have a 800W load on one side and a 100W load on the other side. 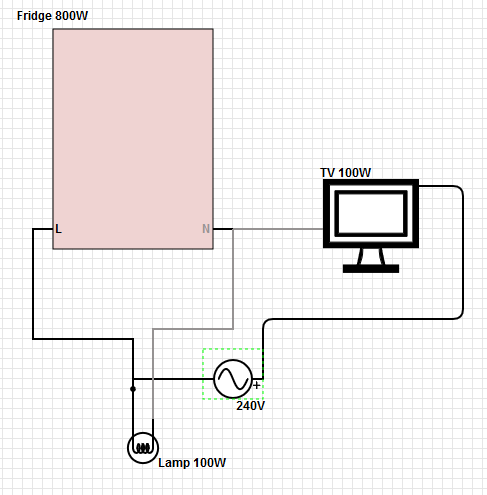 From the 100W load's point of view, the 800W load is a dead short and therefore the TV receives about 200V. Kaboom! 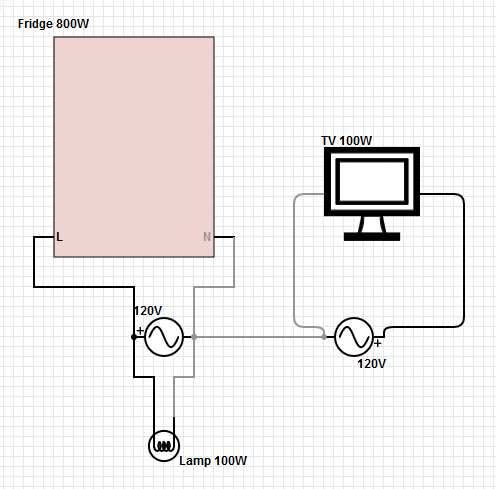 After the TV has melted and burned, there is now an open circuit, so the fridge and the lamp turn off. You go to the closet and grab a bulb. You turn off the switch to change the bulb safely, but you still get electrocuted, because switches only switch the hot side of a circuit, not the neutral. So the current flows from the transformer, through the fridge, through the threads on the light bulb socket, through your heart, then to the ground via the metal ladder. Even if you turned off the breaker for the lamp, the breaker for the fridge is still on and you still get electrocuted. You cannot do this repair safely, because the broken conductor is most likely located upstream from the main breaker, and therefore someone from the utility will have to remove the meter from the sealed enclosure to diagnose the fault safely. In the meantime, turn off the main breaker, as this is a dangerous situation. It sounds like either the transformer feeding your house has an issue, or the neutral is broken. It seems like a local issue since the average of the two legs is 115V, which is a normal voltage in North America. You should throw your main and call the power company. Sounds like you have a bad neutral. You need to turn off the power until it is found and rectified. I think it would actually be best to turn off your main breaker or open your main disconnect first, THEN turn off all the other breakers until the problem is fixed and power is restored. Then call the power company, or an electrician if you can get a faster response. When the problem is fixed, turn on the main first, then turn on the branch circuit breakers (after verifying voltages if possible). With an open service neutral you'll see the voltage change on 120V circuits - circuits on the more heavily loaded leg will fall, circuits on the less heavily loaded leg will rise by the same amount - they'll still add up to about 240V or so (whatever your actual line to line voltage is). For this reason, if you start turning off branch circuit breakers off you may very well make the imbalance worse and do more damage to your electronics etc. It's also a little safer to close your main with the branch circuit breakers open, then close the branch circuit breakers. Tell the electrician that you've been told that you have a lost neutral. He should know how to test for that. You said that you had 90 v at some receptacles and 140 V at others. This was with some loads connected. This is diagnostic for a lost neutral. With a lost neutral if all loads are off you will measure the same voltage at all 120 V circuits (hot to neutral or hot to ground). If you add a load on one receptacle, then voltage on the hot for that receptacle (and the voltage on any hot on that entire leg) will be lower than 120 V. And on the other leg voltage on any 120 V hot (measured to neutral) will be higher than 120 V by the same amount as it was lower on the loaded leg. A good load is a hair dryer or a vacuum cleaner or an electric space heater. I have learned a lot from all the answers, and it may be that what my point here is so obvious that it doesn't bear mentioning, but it was not obvious to me and the same may be true for some others. It seems to me that the effect of the grounding (earthing) paths has not been attributed as the cause of the damaging voltage rise on one leg due to a lost neutral. Evidently in the US we use the TN-C-S grounding system. See https://en.wikipedia.org/wiki/Earthing_system for which a broken neutral is a major safety risk. If the neutral is lost (completely or partially) the only or main return current path from the panel (ground rods) to the transformer (ground rod) is through the earth, a path which has significant resistance (unlike an intact neutral which has effectively zero resistance). For the 125 V power draws in the house, the current flow back to the transformer is the difference between the current in the two hot legs. An imbalance in the two legs will appear as a non-zero current in the return path. If the low resistance neutral is lost, this current will cause a voltage difference (V = IR) between the ground rods at the consumer panel and at the transformer. This voltage difference will be subtracted from the voltage of one leg in the house (the higher loaded one), but added to the voltage at the other leg (the lower loaded leg). Hence any equipment on the lower loaded leg will get higher than half the voltage difference between the legs. And there could be a cascading failure because every time a load disappears (as equipment fails) on the higher voltage leg the voltage gets that much higher. I played around with the infinite grid of resistors model of the path from the house ground rod to the ground rod at the transformer pole and got stumped and humiliated pretty fast. @Harper referred to this in his comment. I guess one could estimate the resistance per foot of the soil and then the number of ft to the pole would be m. But my takeaway is there is significant resistance between the ground rod of the house and that of the transformer pole. I have two ground rods in series and I could disconnect the outer one from my panel and using jumper cables and an extension cord measure the resistance. Not sure I'll be able to motivate myself to do this though. Does anybody know the resistance through 30 ft of "soil" (now very wet Dallas soil)? EDIT2 I now realize that I would have to disconnect both ground rods to get an accurate measurement and I am not willing to do that. In my yard away from the house I could stab two scrap pieces of cut-off grounding rod and see what resistance I get between them. I did go out and pound two 18" long pieces of grounding rod 1 ft into the ground 30 ft apart in our very wet backyard. I used a 50' extension cord as an extension of the test leads of my new Fluke 115 true rms multmeter in the resistance mode. Of course, this is a DC measurement and quantitatively meaningless but I'm just reporting what I got. Someone here must know what a valid result should be. The first value that appeared on the display was ~ 40 ohm and this rose over ~10 seconds to ~ 120 ohm. I can see that a DC ohmmeter is not going to give results meaningful for 60 hz ac, but I'm just reporting what I got. I would guess ~ 2 ohm to 20 ohm impedance for 60 hz. Rmm = R(2/pi)(1 + 1/3 + 1/5 + 1/7 + . . . + 1/(2m-1)). 0.57722 / 2 + 0.69315 + (1/2)Ln(m) = 0.98176 + (1/2)Ln(m). The logarithmic formula gives 0.98176 + 0.5 Ln(7) = 0.98176 + 0.97296 = 1.9547, and the logarithmic formula gets closer and closer as m >. Rmm = ~ R/pi (1.9635 + Ln(m)) where m would be the number of diagonal steps between the two nodes. So we can see that the resistance between the ground rod of a house and the ground rod of the transformer is a logarithmic increasing function of the distance. This means it is a very slowly increasing function of the distance. Not the answer you're looking for? Browse other questions tagged electrical-panel or ask your own question. Can I upgrade my service and install a new panel? Does a 125 AMP panel require a heavier supply cable than a 100 AMP panel? How do I convert a service panel to a junction box? How do I know if I can run power to a garage from my breaker box? Is a 200 amp panel adequate for my needs? Does my panel with a separate disconnect need an isolated neutral bus? 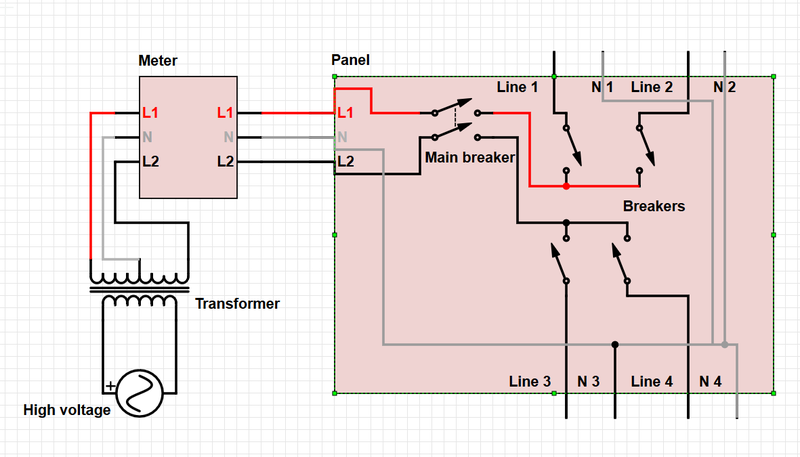 Can a sub-panel have a larger main breaker than the feeder breaker in the main panel?